Sheffield Eagles’ hopes of a top four finish suffered a massive blow as they slipped to a disappointing home defeat at the hands of Workington Town. The Cumbrians claimed their second victory of the season as the Eagles failed to build on thewin over Dewsbury. The home side had the first sight of the line when an incisive set of six saw Cory Aston plant a grubber kick which saw Jamie Doran collect smartly but he put a foot behind the dead ball line forcing a goalline dropout. The home side made the breakthrough with the resultant set of six when Menzie Yere made the telling break through the Town rearguard and his timely offload was inch perfect for the advancing run of Lo, who made no mistake to cross the whitewash. 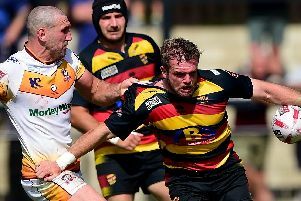 Sheffield’s joy proved short lived when Carl Forber’s kick on the last saw Jarrad Stack get the better of a retreating Eagle in the aerial duel and Declan Hulme was in support to go over. The home side regained the lead when Lo made a superb break down the left flank and although his rampaging run was halted the winger got back on his feet to evade the attentions of Brett Carter, to reach for the line successfully. Jacks executed a perfectly-weighted kick which saw Quentin Laulu Togagae go over between the sticks but the try was offside. The moment proved crucial when Town swept upfield as the Eagles conceded back-to-back penalties and Perry Whiteley was the grateful recipient of good hands along the line before Forber added the conversion followed by a field goal after Sheffield were penalised for interference at the play of the ball. Eagles# heads were bowed at the interval as Doran’s bobbling kick on the last bounced invitingly into the path of Forber, who grounded the ball smartly before converting his own try, to give the visitors a 12-point advantage. With Rob Worrincy replacing Quentin Laulu Togagae at full back for the second half, the visitors started strongly and Jack Murphy’s powerful run and pass presented the opportunity for Whiteley to bag his second of the afternoon. Forber added a second penalty goal before the home side got themselves back in the game when Jacks teased the defensive line before floating a superb offload into the path of Ben Blackmore, who ghosted over the line. Town conceded three penalties and the home side made them pay when Elliot Minchella’s pass gave Scott Wheeldon the chance to go over, with Aston slotting home the extras. However, the game took a cruel twist when Forber’s kick forward bounced off Michael Knowles and Kris Coward was on-hand to cross the line before Jarrod Sammut saw yellow for Town. Town defied their numerical disadvantage to extend their lead when Doran paved the way for Whiteley to notch his hat-trick score. The Eagles gave the scoreline respectability when Worrincy strode down the right to go over in the corner before Togagae’s superb break saw Aston cross the line.